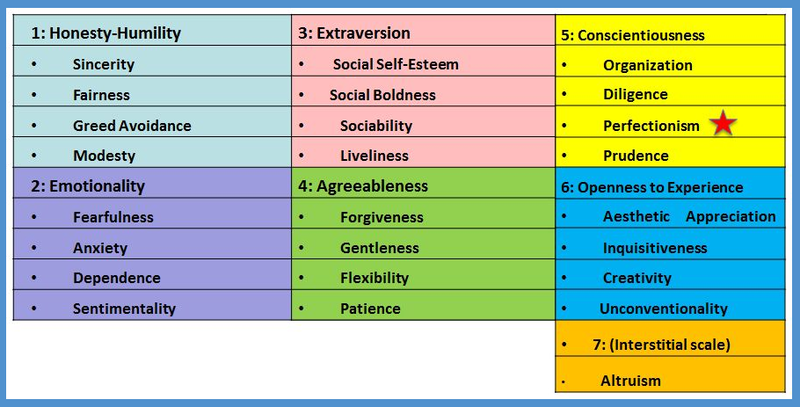 Above is a diagram of the HEXACO or six factor model of personality, as discovered by Lee and Ashton in the early 2000’s. We have the personality records of many thousands of people who have completed the HEXACO, and I personally do many debriefs on the psychological test results of people, many of whom are current or aspiring CEOs. Successful CEOs are usually above average on agreeableness, suggesting an approachable, easy to get along with style, with an absence of “trait anger” – no short fuse. Openness – the characteristic of being open and receptive to new ideas and ways of doing things – varies widely amongst CEOs. Some are very flexible and welcoming of new ideas and others have their preferred and trusted ways of doing things. It is possible to succeed as a CEO using either of these approaches – it really depends on the challenges facing the organisation at the time of the CEO’s tenure. You are probably thinking of a CEO you know and reflecting on the fact that he or she differs from the outline above. At the individual level this often happens, although I would have to say that I am more often struck by similarities in the personality profiles of successful CEOs than by the differences. Now for the key point of this post – something I have often noticed. You will see under the heading of conscientiousness that there is a facet called perfectionism. Perfectionism is the characteristic of being detail minded – someone who crosses the “T”s and dots the “I”s. What I have often noticed is that while successful CEOs are usually high in all the other characteristics of conscientiousness they often have modest scores in perfectionism. We have also seen where CEOs who are high in perfectionism can struggle to do the CEO role well. I believe that perfectionism can represent a “glass ceiling” for those who are aspiring to the role of CEO. As you rise up the ladder of seniority you increasingly need to be prepared to leave the detail of your subject matter area behind. Let’s say you are an engineer. As your seniority increases need to stop descending into the technical detail of the engineering task and focus more on strategic issues and on people leadership. The technical stuff that you used to do will need to be done by your staff. It is your job to set the direction and to teach the staff to produce high quality technical work and then empower them to get on with it. The problem is that if you are high in perfectionism you are likely to have a significant disinclination to do so. You love the detail – you are fascinated by it. When things get tough you take comfort in it. You know you are a good engineer and you take personal pleasure in it. Perfectionism, like all personality characteristics, has a strong genetic component, so it tends not to yield with time. If you are high on this characteristic you are going to have to cultivate the attitudes and self management skills to act differently – building the capabilities of strategy development and effective delegation. That’s if you don’t want to hit your glass ceiling as you pursue your ambitions. To find out how to measure these characteristics in prospective employees click here.